Psychological thrillers are, at their core about a fundamental loss of control: Be it sanity, freedom, or identity. The genre has been overdone, with each new entry trying desperately to shock with a surprise ending, unflinching brutality, or a scathing accusation against the system that routinely fails those with mental health needs. 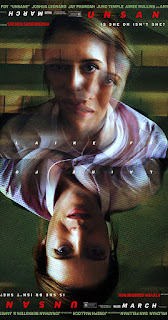 Renowned auteur Steven Soderbergh's latest, Unsane, is a minimalist foray into the quagmire of mental health treatment and law, layered with a deceptively simple stalker story. The magic is that these familiar elements are nothing short of terrifying in the hands of one of the most gifted talents working today. Sawyer has relocated to a new city to escape a dangerous stalker who infiltrated every aspect of her life. Fearing for her sanity, she seeks help from a local hospital which results in her being committed against her will, making her vulnerable to not only her personal demons, but possible external threats as well. Personal agency is the focus of Jonathan Bernstein and James Greer’s stripped down script. The story is almost too convenient at times, placing elements that may or may not be real within Sawyer's path. The terror is in how innocuous these horrors are with respect to everyday life. A law enforcement professional (one of the film's best surprises) casually explains how the heroine needs to change her entire life to survive, giving power to the specter that harries her at every turn. Apathetic orderlies restrain, inject, and politely threaten in an effort to "heal" their charges. The institution itself appears as a relic, a place out of time where the comforts of modern life are casually stripped away in order to protect staff and patients. Isolation is the mandate, a tactic that is also employed by Sawyer's demon, who may or may not even be real. This is one of the many slick aspects of Soderbergh's design. There is little exposition outside of memories and it's entirely possible the narrator is unreliable. Soderbergh shot the entire film on an iPhone 7. The result is a boxed in feeling that never relents. The entire world appears sterile and closed off, perfectly emulating Sawyer's ordeal. There are some remarkable shots that are soaked in blue, one of Soderbergh's trademarks, and here their purpose is to signal danger that masquerades as comfort. The padded walls of a solitary cell are blue, as are some of the pills and bedding, a nefarious reminder that calm is a lie and dangers abound. One of the most fascinating elements is the blocking. The climax, in particular has the feel of a stage play, with the principals' body language and proximity communicating more than their words, words any film lover has heard over and over again. Subtext is everything in Unsane, down to the positioning of key items and words left unsaid. Claire Foy gives a powerful, profane performance. She harnesses both melodrama and prideful surrender on command and her scenes within the ward are sensational. This is a complex role, requiring a myriad of emotional responses and Foy nails every single transition. Her scenes of victimization are egregious, her small triumphs resounding, particularly when she's forced to display physicality. Her Sawyer may have been wronged, taken advantage of, and yet, she commands an aura of determination that never relents. It would have been easy to slip into any number of emotional extremes, and yet, Foy remains a center of the psychological storm, invoking violence and humanity whenever required. In theaters tomorrow, Unsane is yet another solid addition to Soderbergh's prestigious portfolio. While some elements of the story will appear preposterous under any sort of deep analysis, this is more of visual acting experience than a taut Hitchcock rip off and its all the better for it. If you're interested in a subversive thriller that toys with convention while remaining respectful to its subject matter, Unsane will not disappoint.